"The aim of the event is to showcase Nigeria, and food is a huge part of it." Indigenous Nigerian foods were overshadowed by foreign meals at the ‘Nigerian Flavour’ festival in Abuja on Saturday. The event, which is part of the ‘Tour Nigeria’ project, was organised by Nigerian Tourism Development Corporation (NTDC) in collaboration with National Institute for Hospitality and Tourism (NIHOTOUR). ‘Nigerian Flavour’ festival featured food courts, music, arts and fashion, and children entertainment. This reporter observed that only few food spots sold Nigerian snacks such as ‘Asun’ (peppered goat meat), roasted plantain and ‘suya’ (roasted steak). Majority of the food courts sold foreign snacks, including hamburgers, shawarma, chicken and chips, vegetable stir fries and sandwiches. Some respondents, who spoke to NAN, expressed disappointment at the low representation of Nigerian food at the event. They said since the event was organised to showcase Nigerian products, it was important that food, an important part of the culture, should get a huge spotlight. Funmilayo Oloyede said she expected to see local soups from all parts of the country represented at the festival with foreign snacks sold at the barest minimum. “I thought I would see a lot of soups and ‘swallows’, local rice and the sorts. “It is quite unfair to see that even at our own event, the foreign foods are taking over,” she said. Charles Obot said that even if the event wanted to have just snacks and ‘finger’ foods, there were a lot of snacks in the Nigerian culture that could have taken the entire space. “For me, the organisers would have found a way to ban the foreign snacks. “They would have simply told the food vendors to bring Nigerian food and snacks or nothing else,” Mr. Obot said. Cynthia Anyanwu said the food courts appeared more like showcases for food outlets so they could gather costumers and did not really reflect ‘Nigerian flavour’. “The aim of the event is to showcase Nigeria, and food is a huge part of it. “They have succeeded in bringing popular foreign snacks here, instead of making sure everyone experiences the Nigerian taste by making it the only thing available,” Anyanwu said. 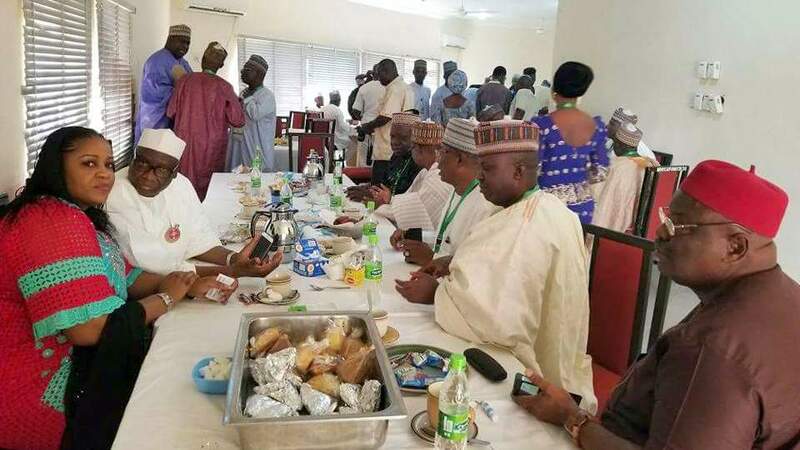 Meanwhile, food and drinks vendors expressed joy at the high patronage at the event as guests were seen munching and drinking away while they networked. A mixologist at Sip Easy, (a cocktail and mocktail stand) Mr. Emeka Nwagwu, said that the turnout for the drinks had been very impressive and he expected to sell during the night show. “We have a steady high patronage now and we know we will sell all we brought when the musicians and younger people come during the music concert,” he said. Ayo Onigbogi, head chef at Ayo’s Grill and Asun, told NAN that his food was fast selling out especially the ‘Asun’, seeing that he was one of the few people that sold the snack. “I am selling and I am happy I came here. People are buying from me because the ‘Asun’ has a lot of Nigerian flavour that they enjoy,” he said. Mr. Onigbogi said that Nigerian foods were not abundant because the event was the first of its kind by the organisers, adding that subsequent editions might be improved on. The festival brings artists, stakeholders and entrepreneurs together to showcase and experience the beauty of Nigerian cultures. This year’s event features food displays, clothe sales, entrepreneurial networking and musical performances from top Nigerian musicians. "I am not on speaking terms with my brothers. But, as I said, I have no hard feelings," Mr P said. The movie is Ogidan's second collaboration with both actors. The National Film and Video Censors Board (NFVCB) and the Alliance Francaise have signed an agreement to showcase and distribute the two countries movies through the "French-Nigerian Film Distribution Conference." One of the quintuplets delivered at the Federal Medical Centre, Lokoja (FMC) on April 17 is dead, the hospital management has said. The event was the singer's first concert of the year. Former President Olusegun Obasanjo thrilled his kinsmen and other dignitaries with cultural dance steps at his native Ibogun Olaogun village, Ifo Local Government Area of Ogun State, on Saturday.